I was called to a 2003 Server yesterday, that was riddled with malware, whatever was on there was generating a lot of network traffic, so the first thing I did was disconnect it from the network. That’s fine, but if I wanted to use my usual ‘weapon of choice’ Malwarebytes, how was I going to get the latest database installed? WARNING: There is a note on the Malwarebytes website that discourages this procedure, as it breaks the incremental update mechanism of Malwarebytes. They recommend that you use this utility to do the job, and that it should be updated every week (though the page currently has December 2011 as the update date!) . In my case once the machine is clean, I’ll remove Malwarebytes and install Trend Worry Free on it anyway. Either way, I prefer to know for a fact I’m using the latest database. 1. Install and update Malwarebytes on a nice clean machine (In this case, my Windows 7 laptop). 2. Find out what version of Malwarebytes you are running (on the about tab). 3. Navigate to the following location, and take a copy of the rules.ref file, i.e. put a copy on a USB thumb drive. 4. If your version is 1.60 or newer you also need to take a copy of the database.conf file that’s in the same folder, but in the configuration folder. 5. Copy the file(s) to the corresponding folder(s) on the affected machine, and paste them over the copies that exist there. 6. 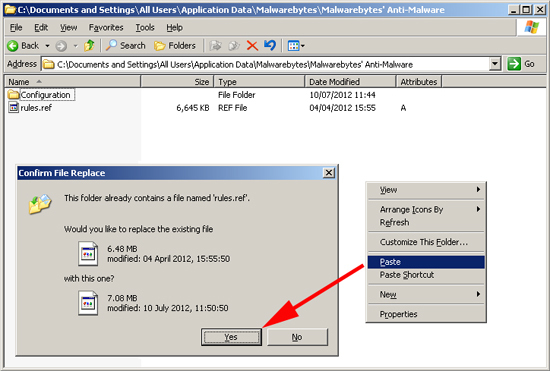 Then launch Malwarebytes on the affected machine, and scan with the updated database.